Beautifully updated 2 bedroom, 2 bath condo on Sunset Beach. This bright and cheery unit has been very tastefully redone and offers all of the comforts of home that you may not want to ever leave!! Freshly painted, newer appliances, new furnishings, flat screen TV’s, washer and dryer in unit and so much more! Enjoy the beach or just relax on your private balcony that overlooks our beautiful Intracoastal Waterways and watch the dolphins swim through to the pass. Whatever you choose, this is the perfect place for it!! This is a wonderful location - gulf on one side, inland waterway on the other and inlet connection so you see a lot of boats and dolphins. Very serene yet only minutes to shops & restaurants. This unit was updated 4+ years ago and this was our 3rd stay here for several months. Great heated (yes really heated to 84 throughout the winter) pool. Very well maintained property with lovely landscaping. Nice walking boardwalk surrounds perimeter of property. We are so glad you enjoyed your stay in this updated condo at Land's End and enjoy the grounds; they really are lovely! Thank you for being our guest and we will see you back for another visit next season!! Always enjoy having you!!! :-) Thank you for being a repeat guest with us and we will see you for your next beach getaway!! Great overall trip. Condo was very nice with high end furnishing. Patio furniture not overly comfortable. Beach equipment was great. Hottub was out of service but 2nd one was available. Overall another great trip to Treasure Island and Land's End. Glad to hear the trip was great overall in this premier condo at Land's End!! Yes, they did have to shut down the 2nd hot tub for a bit as they needed to replace the boardwalk leading up to it. It looks like that should be finalized any day now but we are sorry for that inconvenience. Thank you for choosing to stay with us and we look forward to seeing you back for a future visit. went on vacation at treasure island was surprised to find very few visiters due to the red tide. felt bad for the economy in this area but we still had a great time. The condo was great and the condo complex was beautiful. Glad to hear you enjoyed this premier condo in Land's End and that you did not let the Red Tide affect your visit!! It is spotty in our area, we are much luckier than some of our southern counties but either way we are sorry it is even present. Thank you for sticking with us and we hope to have you back for future visits. We had an amazing time on our Treasure Island vacation. As a family of four we can not recommend this unit enough. Beautifully remodeled, clean and furnished with everything we needed and more. We traveled with two other families that had other units within Lands End complex and neither were comparable. We loved it and we would book again in a heartbeat. Everything is perfect. The apartment is really well equipped and very clean. We have nice bed linens and plenty of fluffy towels. Surprisingly, it is very calm despite the music from the restaurant across the waterway. We didn’t hear anything with the windows closed and the bedrooms are in the back. Reservation with Resort Rental is really easy. This is the second time that we stayed at Land’s End and rented from them. Hopefully there will be a third time soon. I definitely recommend this unit. Fourth time ataying here and it was great as always. Very private, quiet area amd close to several good places to eat and shop. This was our second year in this unit. Really love it and have already booked for 2019! Nice and sunny, spacious rooms, updated kitchen and baths. Easy walk to beach or pool. Nice surrounding boardwalk for am walking. view of dolphins and boats from sliders. This is so wonderful to hear!! :-) We are so glad you enjoy this premier condo at Land's End, it really is a lovely unit and we are glad you are comfortable here!!! Thank you for being our guest and we look forward to your return visit next season!! I cannot praise enough the owners of this condo it was perfect nothing more needed. We wanted for nothing, very richly decorated and big king size master bedroom and all bathrooms were gorgeous and updated. Awesome!!! :-) We agree, this is a very nicely updated condo at Land's End; the owners did a great job and we are so glad you enjoyed it!! Thank you for staying with us and we will see you for the next visit! The condo was exactly like the pictures! clean and a great location. Really enjoyed the water view and watching the dolphins and manatees swim by. The large pool a short walk away was clean and the beach was never crowded.The grounds are well kept and having a guarded community was a plus. Resort Rentals was a pleaure to do business with, very professional and friendly. I even left something behind and they mailed it to me asap! private location but a short drive to many wonderful restaurants. Highly recommend! Awesome!!! :-) We are so glad you were so pleased with this premier condo at Land's End and the community as a whole!! Being a gated community at the end of a peninsula really gives you that "secluded" feeling yet you are only minutes away from all that you need; very convenient! Thank you so much for being our guest and we hope to have you back again soon. We truly enjoyed our time. The condo was beautiful and very comfortable. Easy access to the beach and pool. We loved the bay view from the patio. We will definitely be coming back! We are so glad to hear you enjoyed your time at Land's End in this premier condo!!! :-) Thank you for being our guest and we look forward to your next visit! Was amazing!! The condo was really nice, clean was perfect for us!! We are so glad you loved it!!! :-) This is one of the condos that falls into our premier category with recent updates and the owners did an awesome job, we love that it was a great fit for you!!! Thank you for staying with us and we hope to have you back for another visit soon! beautiful condo and facilities !!! beautiful condo!! pics are accurate that are shown on web site. We will be back as we are almost every summer. We are so glad you enjoyed this premier condo at Land's End, the owners really did a lovely job with the updates and we are glad you liked it!! :-) Thank you for staying with us and we look forward to your next beach getaway! Our condo was beautiful and everyone at Resort Rentals was awesome to work with. Thank you for the kind words about our staff! We love what we do and glad it shows!! :-) So glad you enjoyed this premier condo and we look forward to having you back again soon! Lands End - It's a Secret! Please don't tell anyone about Lands end - it is just the perfect spot for a vacation! Updated and comfortable accomodation, glorious beach, wonderful pool. Quiet yet 5 minutes away from restaurants, shopping. 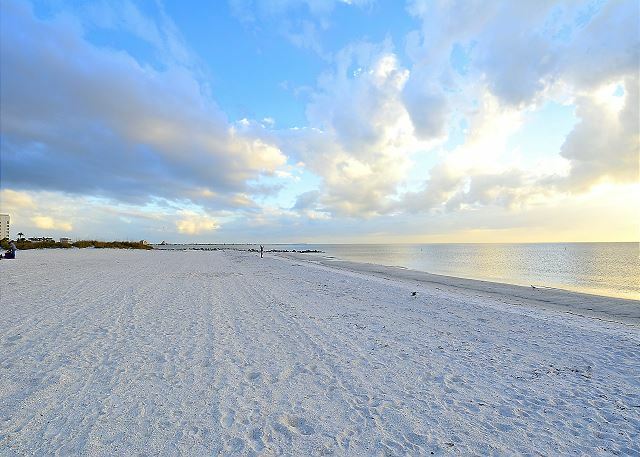 20 minutes to St. Pete's museums and great restaurants. We will try to keep it our little secret! ;-) So glad you enjoy this little treasure, it really is an awesome spot!! Thank you for staying with us and we look forward to your next visit!! Very clean and modern condo, one of the best I stayed at in the resort. Totally looks like was recently remodeled and newer modern furniture everywhere. TV's in every room and very spacious and nice kitchen. Would recommend to anyone I stay atleast couple times a year in Florida and so far this is the nicest looking condo I've stayed at so far in treasure island. Will def be back. This condo worked perfectly for our family and is just steps away from the beach. The complex is beautifully kept and much of the condo itself appeared to have been updated shortly before our stay. The bathrooms were the most dated rooms of the condo but the entire place was clean. With the balcony facing the intercostal, it was just lovely to sit out in the evenings in the shade but still hear the waves splashing just below...and of course the live music on a couple lights from the restaurant across the way added some entertainment as well! Was just a great experience and we'll be back! These condos are in a beautiful place! Condo had new furnishings and was well equipped with dishes washer dryer, etc. wonderful vacation! This is for 306, I made an error, unit 305 was nice but 306 is the one I saw in January and liked so is a more comfortable unit. We have been coming to Land's End for many years and we are always very pleased with our time spent there. We only wish it was longer! The folks at Resort Rentals are a pleasure to deal with and we hope to see them again next summer! We loved this unit and Land's End in general. We have used this unit before and feel right at home. "Just what was needed after 115 inches of MA snow"
Gayle, especially made us feel soooooooo welcomed. Thank you. Just returned from a 3 week stay at Lands End Resort. The resort is in a great location away from the crowds but close to everything. The resort is beautifully maintained and everything is clean and inviting. The pool is large with lots of chairs however even though the signs say no seat saving towels are placed on chairs early in the morning and no one is occupying them or in the pool. We did experience times when we couldn't get a chair but this is not a reflection on the resort but on the people who ignore rules. The security staff are excellent (hi Mark ) and efficient in their job. We had a view of the inland water and though some complained of the music from the bars across the way we quite enjoyed sitting out and listening to the music while enjoying a drink. There are many bars and restaurants close by so dining is not an issue. One of our favorites was the Salty Rim with an outdoor bar and dining with casual entertainment on the week-ends. We were in unit 306 of building 4 and it was quite nice with the exception of the en suite bathroom which is need of upgrading and cleaning. Overall the resort to us was a 9 out of 10 and we will be back. Hi Ms. Parkin, we wanted to let you know that the master bathroom is now upgraded. The condo is now of our Premier units! Hope to see you again soon! The condo is located on the channel. We love the view. The staff of Land's End are friendly and helpful. My granddaughter loves the beach, hunting sea shells and the pool. I will come back and I will be calling Resort Rentals for my stay. They were wonderful and helpful and the condo we rented was fabulous! The apartment has the perfect location. Morning sun on the balcony and a nice view of the channel. Only a few steps,to the great beach and a nice community. Some of the furniture is old, but there's a lot of beach equipment in the aparment . This condo has now been upgraded and is one of our Premier units! We enjoyed watching the boat traffic and people fishing. Music and night life across the river was entertaining. The weather was ok during our stay. My family loved the fishing both in the river and the ocean. We had a wonderful time. We stayed at Lands End for Christmas and had a wonderful week. We were in a corner condo with a view of the waterway and enjoyed watching the fishermen, boats and activities at the restaurants across the water. The beach was beautiful and it was great to have chairs and umbrellas at the condo. There are a variety of restaurants in the area and it was an easy drive to visit Universal in Orlando for the day. We hope to revisit Lands End again some day. Nicest Resort in our 38 years of coming to Florida. We had a couple of very minor issues when we first arrived; phone had static, main bed sheet small whole and dryer taking a long time to dry. All were resolved within an hour. Resort Rentals was by far the best agency of this type we have ever experienced. We were impressed with everything about this resort and will be booking here again on our next visit. Very calm, peaceful and lots to do. We come back every year to stay at this property. Top notch property clean and updated. Enjoy working with the property management. This condo was bigger than I expected and in a nice position overlooking the inland waterway. I was pleased that wifi was available, a big plus. The owner had 2 very large steel cabinets in each of the closets which mesnt that hanging space was limited, so I had one closet and my husband the other. If there was more than 2 guests and staying for a longer time then that might be a problem. Also one of the shelves in the closet seem to have light bulbs by the dozen. Although everything was clean and tidy I did feel that all kitchen and bathroom cabinets could do with updating as they look like the originals from 1980/90s. There was no kettle and being English we need a kettle to boil water for tea etc. When I called into Resort Rentals to ask for Yellow Pages I mentioned no kettle and they did offer to see if they had one I could borrow but friends had already provided one. Whichever condo I've been in drawers in bedroom cabinets/chests always seem to stick or drop. On our last day we spent a couple of hours on the balcony watching 2 dolphins at play. Overall we really enjoyed our stay, the grounds are always well maintained and I have always found the Lands End staff to be very friendly. The condo was perfect for me and my family. It had internet and even an monitor to hook a laptop up. It was clean and simply decorated. I would recommend this condo. We had a great time and the weather was wonderful. We did find something in our condo that was not ours & we called management & they did come & remove the item. Had problems with tv & maintenance came very quickly. The bathroom sink drained very slow.This is the 4th time I have stayed at Lands End and love the location & we love staying on the bay side. Will be back again. Thanks so much for the great numerical ratings! I was glad to hear we were able to get the unforeseen issues resolved quickly for you. The best part about your review was hearing that you have been here 4 times and will be back again! Repeat business is our highest compliment. Thanks again! A wonderful experience at Land's End. Wonderful experience with everyone involved. Would definitely return to stay at this property in the future. Land's End is a wonderful place to stay. Our property was nicely decorated and well kept. Nice swimming pool and a great beach area (quiet and clean. Love the location of Land's End it is very private and quiet area to stay. The entire complex is well maintained. Close to shopping and good resturants to eat. Our unit had a great view from the balconey. I am very pleased to work with Resort Realty, they are efficent and very willing to make your stay a pleasure. Right there to fix or aid you in anything that goes wrong in the unit. This is why I have stayed in this unit for the past 6 years. Thanks for your review. Pleased to hear there were no problems. We have several Gulf front units available in our rental pool for your next stay! Fantastic stay, wish it was longer! There were no sheets for the sofa bed. A samll error, but something I feel should not be overlooked. And the sheets that were available for a twin bed were stained. Microwave handle was broken making it almost impossible to open or use. Notified Mgmt.